Qualitative research is a family of methods used by researchers in social science, marketing, and other areas of work. These methods are generally intended to gather data that provide rich, in-depth, and contextualized representations of human behavior as it occurs in natural settings. These settings are inherently complex and behavior is driven by a wide range of factors. People naturally live their lives through sets of activities embedded in daily routines - just think about a typical day for yourself, or a typical week. What do you do? Why? People's behavior and thoughts are influenced by many things including culture, value and belief systems, resources, personality characteristics, personal history, emotions, habits, opportunity, and real or imagined constraints. Understanding and recognizing the complexity of the human socio-cultural environment is the key to strong research. In contrast to the goals of quantitative research methods, qualitative methods embrace this complexity and seek answers to the 'why' and 'how' questions as opposed the 'what' and 'how many' questions that quantitative methods address more efficiently. There are many data collection methods that qualitative researchers use in their work including interviews, focus groups, observation, participant observation, the collection of stories, field notes, site documents, memos, journals, archives, diaries, photography, and videography. These approaches come from a variety of schools of thought including grounded theory, ethnography, and community participatory research and have grown out of disciplines like anthropology, psychology, sociology, and cultural anthropology. So what kinds of data do qualitative researchers collect and what do they do with these data? Qualitative data are the words, pictures, audio, and/or video generated by researchers and research participants. Qualitative investigators will often have a particular research focus for their study and so they explore these data with an eye for identifying the key themes/concepts in the data that can provide a deeper understanding of the research problem being investigated. These themes/concepts become the conceptual framework that the researcher will use to organize and, understand what is meaningful in the qualitative data and then communicate the results and findings of their work to their research audience. Particularly early in a project, this framework evolves as the researcher gains a deeper understanding of the data and how the themes and concepts are related to each other and then organized into a code/tag tree. This tree can be thought of as a way the research will be organized and communicated and, often, will include different levels representing greater and lesser levels of specificity -- a hierarchically organized outline with super-ordinate and sub-ordinate levels (or parent and child code/tags). The researcher then examines the data, identifies portions (excerpts/clips) which contain content meaningful to their research focus and research questions, blocks these portions, and then applies any number of appropriate code(s)/tag(s) - a process we refer to as excerpting and tagging. Then all the excerpts and the codes/tags that were applied are analyzed using different visualization tools as the researcher looks to understand the phenomenon of interest and how patterns in the data expose the deeper and more complex meaning as communicated by the research participants. Mixed method research seeks to bring qualitative and quantitative approaches together. Most people are familiar with quantitative tests and surveys. These approaches are great for answering the 'what kinds' and 'how many' questions. When this type of information is integrated with the rich and complex data collected via qualitative methods - the 'how' and 'why' information - an entirely new set of questions can be addressed. While there have been debates about the relative value of different methods, William Tronchim (a prominent Cornell University social scientist), '... [any] kind of polarized debate has become less than productive. And, it obscures the fact that qualitative and quantitative data are intimately related to each other. All quantitative data is based on qualitative judgments; and all qualitative data can be described and manipulated numerically.' As each type of data provides different representations of the world, we believe their integration widens the range of perspectives that can be explored to finding useful answers to research questions. Once these data are imported, tags and excerpts created and all the connections established, there are a variety of approaches one can take to include both qualitative and quantitative data in 'query' or analysis tasks. That is what may be learned from a purely qualitative approach can be divided based on the characteristics of research participants or settings. Such division can expose important differences in the patterns within the qualitative data as a function of descriptive characteristics. As an example, say we collected data from parents about reading activities at home after their children were exposed to a new teaching method at school. At first glance, we see that the stories are generally positive. However, we might have a notion that the effects of the program may be different depending on things related to the child and home environment. So, we next divide these stories up as a function of child gender (male and female) and mother work status (unemployed, part time, and full time) resulting in six piles of stories instead of just one. From there, we might be able to see that stories in one pile are very positive, two piles are somewhat positive, two piles are neutral, and the remaining stories are quite negative. Knowing how we divided the piles up can then tell us much more about the relationship between this new teaching method and home events, for example, where is it working best, where it makes little difference, where it works poorly, AND much more about why and how when we look into what is communicated in the stories. This seems like a simple concept, yet without a well-planned research design and data preparation, these more complex and important questions cannot easily be identified or addressed. Moreover, manipulating these kinds of data can be very difficult. This is precisely why Dedoose was designed--so that researchers can easily integrate these data and patterns can be quickly identified. It is easy to dig beneath the surface of the patterns to understand the 'how' and 'why' that explains the 'what' and 'how many' questions. A second and extremely useful approach to blending qualitative and quantitative data is by the use of code weighting or rating systems. As a simple illustration, let's take 'cost' as a code that would be used to tag content in peoples' qualitative reporting of their car purchasing thought process. Say we then ask people about the things they consider when making a decision about purchasing a car. Many people in our study might mention 'cost' as a factor in that decision process. However, some may talk about cost as very important and others less so - instead mentioning 'style' as relatively more important. Using a code weight/rating along with this code opens up a variety of additional analyses that would not be otherwise possible. So imagine that we develop a 10-point rating scale that we use to index how important 'cost' is when we used the code to tag 'cost' comments. If we then divided up the different cars that were being considered, we might see that some cars got an average of 3 and some an average of 9. 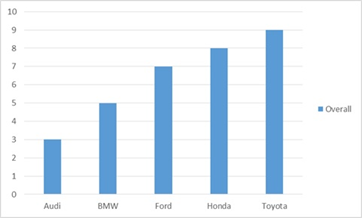 This information could be displayed in a simple bar chart with a bar for each car and then the size of the bar indicating average 'Cost' importance. Now imagine you are trying to develop an advertising campaign for one of these cars. This simple example shows that whether you choose to emphasize value can depend on a variety of factors related to the customer you are targeting. Further, the words you choose to use when messaging about 'cost' can also vary by these same factors. So, you'd want to look not just at whether value is important to your target customer, but how they talk and think about 'cost.' This is where is all comes together and where Dedoose features are designed to help researchers quickly visualize, understand, and dig into the underlying nuances of these questions. Dedoose features help tie these data together, allowing you to generate charts based on descriptors and code weights/ratings, and, with a simple click on a bar or cell of a table, you can pull up all the stories that sit beneath the surface. You can quickly export the visualizations from anywhere inside of Dedoose along with all the underlying qualitative data and you are ready to drop the visuals into reports and presentations and report on the rich underlying qualitative findings. This car purchase decision process is a very simple example of how valuable the Dedoose code weight system can be. It is also important to appreciate that these code weight/rating systems can be developed for any concept/theme where a distribution can be represented on a numerical dimension. These distributions can be used to represent relative importance, quality, centrality, 'sentiment,' strength, reliability... Making use of this Dedoose feature essentially allows you to introduce an entirely new dimension to a project database. As another example, in our Dedoose demo project, where we interviewed mothers with children in Head Start programs about the home literacy environment, we used 'quality' ratings alongside the excerpts we tagged with the 'Reading by Mother' code. As we looked at all the stories mom's told us about reading to their young children, we could see variation in what we interpreted as quality. Rating these stories on a 1 - 5 scale that indexed quality allowed us explore an entirely unique dimension in our data. Others in intervention work have indexed dimensions of 'reliability' or 'consistency' as mapped to what patients might communicate about following a diet or medication regime. That is, many may talk about following a doctor's instructions, but how closely they follow these directions can vary. From there, we can devise interventions or communication strategies to more closely address the specific changes and, hopefully, encourage more successful outcomes. How useful these weights/ratings can be is only limited by the extent of your imagination, creativity, and flexibility in thinking about your qualitative data and how you develop and use your code system.